Originally published in Creation 14, no 2 (March 1992): 43-47. In most people’s minds today, the radioactive dating of the earth’s rocks by geologists has supposedly proved that the earth is billions of years old. Yet most people really don’t know much about these radioactive dating methods. So slick and convincing are the presentations of results, particularly in glossy media and museum propaganda, that no one even bothers to question how these dating methods work, what assumptions are involved, and how reliable they are. Such questions, however, are highly relevant. The answers are not only instructive, but demolish the evolutionary geologist’s case for a 4.5-billion-year old earth. 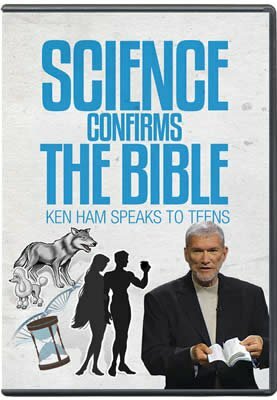 This in turn allows the evidence for a young earth and universe1 to ‘speak’ more loudly in support of the scriptural chronology of a 6,000-7,000 year age, which of course leaves no time for any ‘big bang’ and ‘molecules-to-man’ evolutionary scenarios. Recently, the radioactive dating method which geologists (and physicists) have considered to be perhaps the most reliable has come under heavy ‘fire’. The big surprise is that the attack has come from an evolutionary geologist and has been published in a secular scientific journal! But more of that in a moment. First, let’ s find out how radioactive dating methods are supposed to work. Some types (technically known as ‘isotopes’) of ‘parent’ elements such as uranium, thorium, potassium and rubidium are said to be radioactive because the nuclei of the atoms are unstable, resulting in readjustments between the ‘particles’ (primarily neutrons and protons) in the nuclei with time. To achieve stability, some ‘particles’ are ejected from the atoms, and these moving ‘particles’ constitute the radioactivity measured by Geiger counters and the like. The end result is stable atoms of the ‘daughter’ elements lead, argon, and strontium respectively. Thus the first step in the radioactive dating technique is to measure the amounts of the parent and daughter elements (isotopes) in a rock sample via chemical analyses. This is done in specially equipped laboratories with sophisticated instruments capable of very good precision and accuracy, so in general there is no quarrel with the resulting chemical analyses. the radioactive decay rate has remained constant. So that these assumptions are easily understood, they are best explained in the context of the hourglass analogy (see Figure 1). Grains of fine sand fall at a steady rate from the top glass bowl to the bottom. At time t = 0, the hourglass is turned upside-down so that all the sand starts in the top bowl. By time t = 1 hour, all the sand is supposed to have fallen into the bottom glass bowl. Now this ‘clock’ works because the initial conditions are known—that is, all the sand grains are in the top glass bowl and none are in the bottom one. 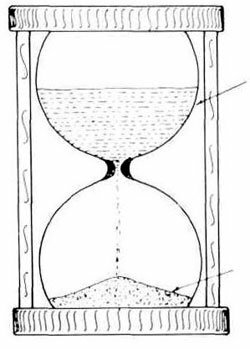 If there is already some sand in the bottom glass bowl, then unless this amount is known the hourglass ‘clock’ cannot ‘tell’ the time. Similarly, if the system has not remained closed (for example, if sand were somehow added or subtracted), then the calculation of the elapsed time, based on comparing the amounts of sand in the two glass bowls, will again lead to an incorrect conclusion. And finally, if the rate at which the sand grains fall from the top glass bowl to the bottom one varies (for example, moisture causes some clogging of the sand in the constriction between the two glass bowls), then again the hourglass ‘clock’ will be inaccurate. The radioactive decay of ‘parent’ isotopes of uranium, thorium, potassium, and rubidium to ‘daughter’ isotopes of lead, argon and strontium respectively is analogous to our hourglass ‘clock’, including these three assumptions. However, in the case of these radioactive ‘clocks’ these three assumptions can be shown to be not only unprovable, but invalid, rendering these ‘clocks’ virtually useless. In the case of the initial conditions, no scientist can ever be sure as to what they were, because no scientist was present here on the earth at its origin. Thus the amount of daughter isotope that has actually been derived from the parent isotope by radioactive decay is unknown, since some of the daughter isotope might have been present with its respective parent isotope at the time of the earth’s origin. So geochronologists have assumed that the uranium, thorium and lead isotopic composition of particular meteorites is equivalent to the initial composition of these isotopes when the earth came into existence. This is assumed because it is supposed that these meteorites represent fragments from another planet in the solar system similar to our earth that disintegrated very early in the history of the solar system. However, not all meteorites have the same uraniumthorium- lead isotopic composition, so why should the isotopic composition of these particular meteorites be considered to be the ‘correct’ composition for the earth at its origin rather than some other composition found in other meteorites? Furthermore, even if today’s scientists believe they have the methods, for example graphical and mathematical, for determining how much of the daughter isotope might have been present either at the origin of the earth or the origin of the rock being dated, no one can ever be sure that these ‘answers’ are correct, because there was no scientist present at the beginning to observe those initial conditions, even though the scientists’ calculations may be extremely logical. Similarly, there is no way that it can be proved that these radioactive systems have been closed through all the supposed millions of years of decay of parent isotopes into daughter isotopes. Again, the main reason for this is because no scientist has been present to observe everywhere these radioactive systems and so report that they have been closed through all their history. Indeed, the evidence indicates the very opposite, that is, that these systems have been open to all sorts of external influences. For example, it is known that uranium is generally a mobile element in the natural environment, particularly in groundwaters near the earth’s surface. Thus, if a rock sample is analysed at or near the earth’s surface for its uranium and lead isotopes, it would be incorrect to assume that all the uranium and lead in the sample were there only because of the amounts placed in the rock at its origin and because of undisturbed radioactive decay from uranium into lead. Some of the uranium might have been leached out of the rock sample, hence making the rock appear older than it really is according to this radioactive ‘clock’. Or, some uranium might have been deposited by groundwaters into the sample, thus making it appear younger than what it really is. Indeed, geochronologists often plot the chemical analyses of the isotopes, expressed as isotope ratios, on graphs, and these often show that the parent-daughter systems have not been closed, but open. Furthermore, by interpretation of these graphs they often claim to be able to quantify the loss or gain and thus overcome this difficulty to still ‘read’ the radioactive ‘clock’. However, once again this interpretation to overcome this problem of the invalidated closed-system assumption cannot be proved, but is merely assumed to be correct because it makes the radioactive ‘clock’ work. The final assumption is, of course, that the radioactive decay rates have remained constant. However, once again, this assumption can in no way be proved, because there were no human observers present right throughout the earth’s history to be constantly measuring the radioactive decay rates and to have recorded them. It is special pleading on the part of geochronologists and physicists to say that the radioactive decay rates have been carefully measured in laboratories for the past 80 or 90 years and that no significant variation of these rates has been measured. The ‘bottom line’ is really that 80 or 90 years of measurements are being extrapolated backwards in time to the origin of the earth, believed by evolutionists to be 4.5 billion years ago. That is an enormous extrapolation. In any other field of scientific research, if scientists or mathematicians were to extrapolate results over that many orders of magnitude, thereby assuming continuity of results over such enormous spans of unobserved time, they would be literally ‘laughed out of court’ by fellow scientists and mathematicians. Yet geochronologists are allowed to do this with impunity, primarily because it gives the desired millions and billions of years that evolutionists require, and because it makes these radioactive ‘clocks’ work! So we have seen that none of these three basic assumptions which are foundational to all the radioactive dating techniques can be proved. Indeed, we have also seen that each of these three assumptions is invalid, not only because no scientist has been present from the origin of the earth to see what it was like then and to report as an eyewitness all that has happened everywhere since, but because we know of observations contrary to these assumptions. Apart from the initial conditions, the major problem facing geochronologists is that geological systems are invariably open to external influences. Thus, analyses of radioisotopes often produce results that reflect loss, or sometimes gain, of either parent or daughter isotope, rendering single radioactive age determinations suspect. Thus geochronologists tackle the problem by performing a number of radioactive age determinations on a group of samples from the rock under investigation, hoping to pin-point a pattern that will enable the calculation of the desired ‘true’ age. If these multiple isotopic analyses of various rock samples, and minerals within those rock samples, are from the same geological unit, then geochronologists can also use what is known as the isochron age determination method. This method is supposed to allow some of the more uncertain assumptions of the normal age calculating method to be circumvented and so permit a higher degree of confidence in the resulting ‘age’ estimate. Consequently, geochronologists favour this isochron method and so it has become very popular, particularly with rubidium-strontium, samarium-neodymium and uranium-lead isotopic systems. The isochron method works as follows. If a number of rock samples from a single geological unit are carefully collected, then it is claimed that it is reasonable to assume that each rock sample from that geological unit formed at the same time, and therefore ultimately has the same age. However, from experience it is known that each rock sample differs in the amounts of both daughter and parent isotopes contained. 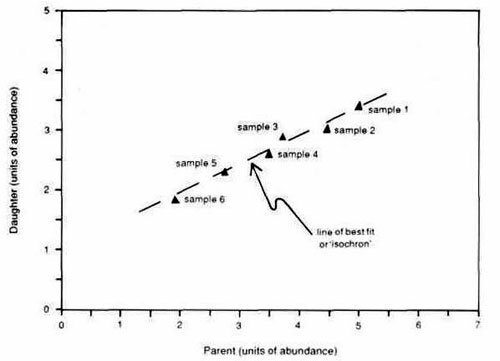 A graph is then constructed so as to plot the amount of daughter isotope against the amount of parent isotope, so the isotopic analysis of each rock sample will then be represented as a single point on this graph. Often these data points, plotted on the graph of daughter isotope composition against parent isotope composition, form a linear array through which a sloping line can usually be drawn with a high degree of fit of the data points to the line, as shown in Figure 2. This is because those samples with larger amounts of parent isotope have correspondingly larger amounts of daughter isotope, and those samples with smaller amounts of parent isotope have correspondingly smaller amounts of daughter isotope, assuming of course that all the daughter isotope has been produced by radioactive decay from the parent isotope. This line is then interpreted as an effect produced by radioactive decay to give an ‘age’ interpretation. Since all of these rock samples are supposed to have been formed at the same time because they come from the same geological unit, this line is called an ‘isochron’ (from the Greek isos equal, and chronos time) or line of equal age. Furthermore, it can be shown mathematically that the slope of the line can then be used to calculate the isochron ‘age’ of the geological unit from which the rock samples came. This method has become popular because no knowledge or assumptions about the initial conditions of parent and daughter isotopes need be made. Furthermore, since the analytical equipment determines isotopic ratios, not absolute abundances of isotopes, parent and daughter isotopes are usually expressed as ratios relative to a reference isotope whose abundance is not affected by radioactive decay, thus providing easy application of the method and more confidence in its results. While the assumptions of constant decay rate and a closed system are again necessary, the isochron method also has two other critical assumptions—the rock samples must represent the one unit that formed at the same time geologically, and the daughter isotope was uniformly distributed through all the samples when the rock unit formed. Because of the apparent ‘success’ of this isochron method, it has become in recent years the cornerstone of radioactive dating in geology. One could hardly expect a more emphatic and complete ‘demolition job’ on the isochron dating method than that! Notice also that Zheng extends his criticism to the traditional uranium-lead (UPb) and currently-in-vogue samarium-neodymium (Sm-Nd) isochron methods. Given now these criticisms from an evolutionist geochemist/geochronologist in the open scientific literature, one wonders how quickly geochronologists world-wide will rigorously re-examine the isochron method and the results it has produced over the past few decades. Of course, abandoning the method could hardly be countenanced, as it would mean abandoning what has become one of the foundational cornerstones to the whole evolutionary view of the geological development of the earth with its millions of years time-scale. Nevertheless, this ‘attack’ on radioactive dating by an evolutionist in the open scientific literature is a timely reminder that there are problems with these methods. Christians need not compromise with the evolutionists’ time-scale because it is being propped up by these faulty dating methods. Rather, we should place our confidence in the 6,000-7,000 year chronology given us by our Creator in His eyewitness account of what happened. Furthermore, the Creator has given us abundant scientific evidence that His Word is true ‘from the beginning’. Humphreys, D.R., 1991. Evidences for a young world. Creation Ex Nihilo, vol. 13(3), pp. 28-31. Zheng, Y.-F., 1989. Influences of the nature of the initial Rb-Sr system on isochron validity. Chemical Geology (Isotope Geoscience Section), vol. 80, pp. 1-16. Baadsgaard, H., Lambert, R.st.J. and Krupicka, J., 1976. Mineral isotopic age relationships in the polymetamorphic Amitsoq gneisses, Godthaab District, West Greenland. Geochimicael et Cosmochimica Acta, vol. 40, pp. 513-527. Bell, K. and Powell, J.L., 1969. Strontium isotopic studies of alkalic rocks: the potassium- rich lavas of the Birunga and Toro- Ankole regions, East and Central Equatorial Africa. Journal of Petrology, vol. 10, pp. 536-572. Betton, PJ., 1979. Isotopic evidence for crustal contamination in the Karroo rhyolites of Swaziland. Earth and Planetary Science Letters, vol. 45, pp. 263-274. Brooks, C, James, D.E. and Hart, S.R., 1976a. Ancient lithosphere: its role in young continental volcanism. Science, vol. 193, pp. 1086-1094. Brooks, C., Hart, S.R., Hofmann, A. and James, D.E., 1976b. Rb-Sr mantle isochrons from oceanic regions. Earth and Planetary Science Letters, vol. 32, pp. 51-61. Chrisloph, G., 1986. Isochron or mixing line? Proceedings of the 4th Workshop Meeting on Isotopes in Nature, Leipzig, pp. 197-207. Compston, W. and Chappell, B.W., 1979. Srisotope evolution of granitoid source rocks. In: M.W. McElhinny (editor), The Earth: Its Origin, Structure and Evolution, Academic Press, London, pp. 377-426. Faure, G., 1977. Principles of Isotope Geology, Wiley, New York. Field, D. and RaHeim, A., 1980. Secondary geological meaningless Rb-Sr isochrons, low 87Sr/86Sr initial ratios and crustal residence times of high-grade gneisses. Lithos, vol. 13, pp. 295-304. Haack, U., Hoefs,J. and Gohn E., 1982. Constraints on the origin of Damaran granites by Rb/Sr and ∂18O data. Contributions to Mineralogy and Petrology, vol. 79, pp. 279-289. Kohler, H. and Muller-Sohnius, D., 1980. Rb-Sr systematics on paragneiss series from the Bavarian Moldanubium, Germany. Contributions to Mineralogy and Petrology, vol. 71, pp. 387-392. Munksgaard, N.C., 1984. High ∂18O and possible pre-eruptional Rb-Sr isochrons in cordierite- bearing Neogene volcanics from SE Spain. Contributions to Mineralogy and Petrology, vol. 84, pp. 281 -291. Qin, Z-W., 1988. Mix-isochron and its significance in isotopic chronology. Science Sinica, vol. B28, pp. 97-108. Roddick, J.C. and Compston, W., 1977. Strontium isotopic equilibration: a solution to a paradox. Earth and Planetary Science Letters, vol. 34, pp. 238-246. Zheng, Y.-F., 1986. Crust-mantle Rb-Sr mixing isochron and its geological significance. Terra Cognita, vol. 6, p. 151 (abstract). Zheng, Ref. 1, p. 2. Arndts, R. and Ovem, W., 1981. Radiometric dating, isochrons, and the mixing model. Bible-Science Newsletter, February, March, April and August, 1981 issues. Arndts, R. and Overn W., 1981. Radiometric Dating, Isochrons, and the Mixing Model, Bible-Science Association, Minneapolis, USA, reprint series, p. 25. Zheng, Ref. 1, p. 13. Zheng, Ref. 1, p. 14. Zheng, Ref. 1, p. 1.